When it comes to landscapes, the US goes for extra large. 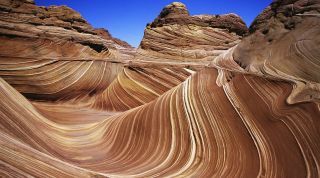 From the Grand Canyon and other must-see high desert, red rock parks on the southwest's Colorado Plateau to Wyoming's Yellowstone, and the Great Smoky Mountains National Park of Tennessee and North Carolina, incredible photographic opportunities abound. Here's a small selection of some of its most dramatic scenery much loved by photographers. Cliché or classic? If you've only seen this giant tear in the Earth's surface on postcards, it's tempting to view it merely as one for tourists trying to tick things off. Pack away your preconceptions and get yourself to the South Rim's Yavapai Point for spectacular panoramic views, and to Mather Point to see the Vishnu Temple rock formation, before spending time at the other viewpoints on Desert View Drive.